Statement: For several years I had been accumulating traditional fabric at the two monthly flea markets in Kyoto (at Tohji and at Kitano Tenmanguu). 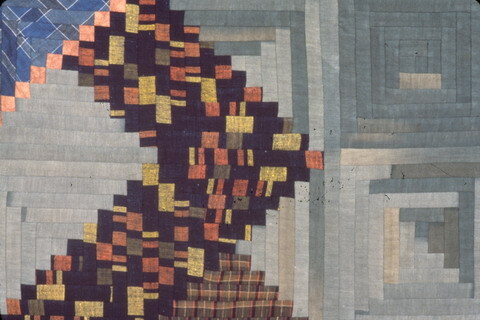 The title "Good to See You Again" refers to bringing these fabrics together in a single quilt. The design comes from adding leftover liquid detergent to a new bottle with a slightly different color and density. As the older liquid gradually penetrates the new, the color patterns shift. The title comes from having accumulated old Japanese fabrics and bringing them to New York, and finally finding a way to bring them together in a single design.